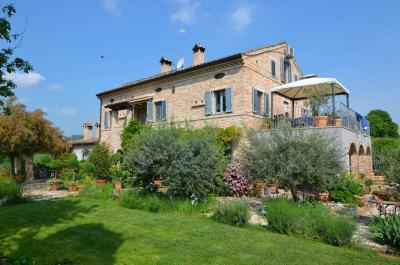 At walking distance from the Historic Centre of Loro Piceno, gorgeous renovated farmhouse for Sale with pool and lovely garden. 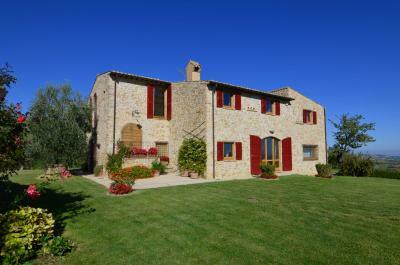 The property is located on a hill south facing with wonderful views of the surrounding countryside. Easily accessible by any car thanks to access road fully paved and well maintained from the Comune. Extremely sunny location surrounded by Nature, far away from any noise. Absolute private. The house has been completely renovated on 2006 by the current owners and is divided into two self-contained apartments, for a total of about 220 sqm. The ground floor apartment has a spacious kitchen with utility room, a living area with wood stove, two bedrooms and a bathroom. This apartment also enjoy a beautiful loggia of about 28 sqm where you can have some delicious lunches/breakfasts. The first floor apartment is reachable from a typical outdoor staircase and consists of a kitchen, a large living room with terrace (about 12 sqm), two bedrooms and a bathroom. Wonderful view. The garden around the house is well arranged and planted with ornamental plants, jasmine, roses and olive trees. Really enjoyable is relaxing in every corner of this beautiful garden. In the southernmost part and most private of the garden, there is also a lovely swimming pool with sunbathing area next to a small vineyard. On the back of the pool there is also a small wooden storage for garden/pool tools. The farmhouse has all the primary services connected including internet and underfloor heating with LPG for both apartments. It's possible to buiyng an extraland of about 5 hectars with a separate price. 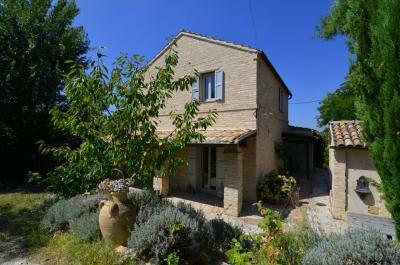 This property is definitely suitable for those who want to have a piece of Heaven in Marche Region, with the opportunity of renting one of the apartments and live in the other one. Having a small profit too. Or, if you are a couple of friends who want to share relax, good food, and Italian tradition, then this is the right property for you. Really an excellent opportunity at about 1 km from all services.